Joshua Sofaer will be resident in Copenhagen for the first two months of 2018, courtesy of Live Art DK, the Danish Arts Foundation, The Danish National School of Performing Arts Further Education, and Ny Carlsberg Glyptotek. During his time in Copenhagen he will be spending time researching and making, taking as his starting point the ‘Nasothek’ at the Glyptotek. 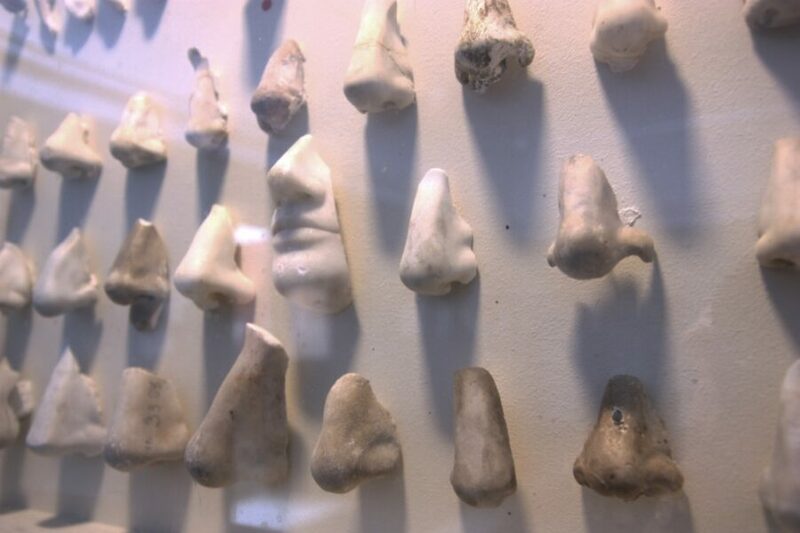 The Nasothek is a collection of nose prostheses, or repairs, once stuck to statues, but that have now been removed, and housed together in a modest display case. Until the early 20th Century it was fashionable to ‘restore’ ancient marble sculptures with missing features and limbs: noses, arms, legs and so forth. Later conservators removed the pieces that were not original to restore ‘authenticity’ to the pieces. The Nasothek houses noses in marble and plaster that were once attached to the Roman portraits in Glyptotek. More generally, Glyptotek is a repository for missing and repaired noses, insomuch as many of the classical statues have had the noses knocked off. Another research interest is Tycho Brahe, the 16th Century Danish nobleman and renowned astronomer, who lost a part of his nose in a sword dual with his third cousin Manderup Pasberg. Joshua will also be spending time in the ceramic studio of Christian Bruun, experimenting with naso-sculptural forms.